CPI.Q is the perfect one-stop resource for researchers in need of information from Canadian-focused journals, magazines, newspapers and reference sources. 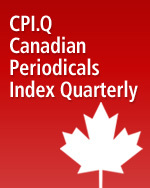 CPI.Q features a wealth of Canadian and international periodicals, Canada’s national newspaper The Globe and Mail, Maclean’s weekly magazine and Canadian News Facts as well as comprehensive encyclopedic reference material. CPI.Q has full-text access to its publications going back to 1980 and continuing up to the present day. However, each publisher determines when the latest content becomes available for use through this service.